Most people who know a thing or two about distilling have heard of the “angel’s share,” the term given to that small portion of spirits or wine that is lost to evaporation during the barrel-aging process. Few however, have likely heard of the “devil’s cut” a term being given to the portion of spirits that’s absorbed by the barrel the spirit is aged in. Now, almost certainly, so few have heard this term because it’s a clever marketing term invented by the folks at Jim Beam, the largest whisky distributor in the world–but nevertheless, it’s an intriguing concept (hey, I’m as savvy as the next big-brand cynic but a cool gimmick is a cool gimmick–especially if it has “devil” in its name!). Wait. Reality check: Jim Beam didn’t really invent a “proprietary process” for getting whiskey out of used barrels. The process for extracting whiskey from used barrels has been around a while (ask any hillbilly or moonshiner). The process typically involves pouring an amount of distilled water into a used whiskey barrel and laying that barrel on its side. You let the barrel sit, rotating it slightly every couple days, and the result is a boozy liquid colloquially called “Swish.” Some people will tell you that Swish is just as good as the real deal and could pass for actual whiskey. Regardless of how original the process is, or how gimicky the concept is, I must admit: the results are pretty damn good. 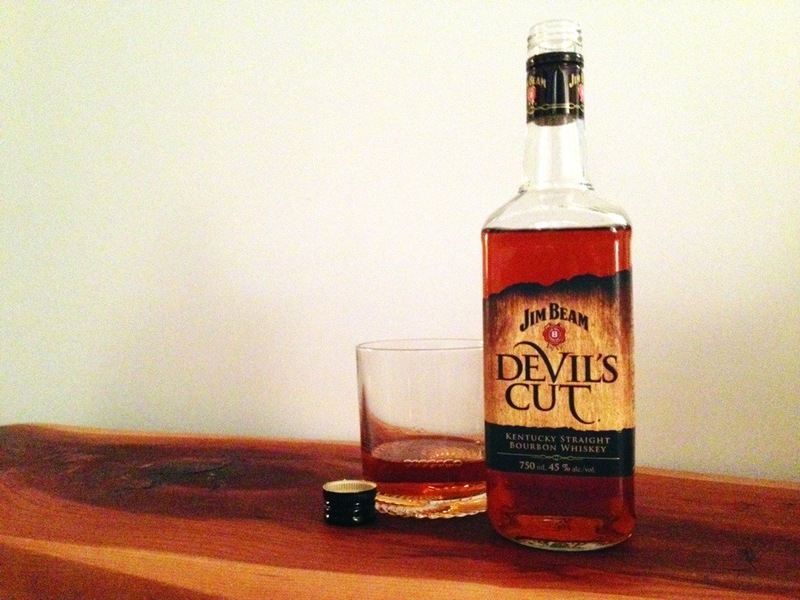 The Devil’s Cut is a bourbon that’s got a lot of great oak and charred wood flavours on the nose and an added kick of higher alcohol and woodsy sharpness in the palate, but finishes pretty well-balanced. This is probably not a sipper, and if smoother bourbons are your thing you should probably look elsewhere, but this stuff does interesting things to cocktails, adding a woodsy, robust punch to an old fashioned or a manhattan. 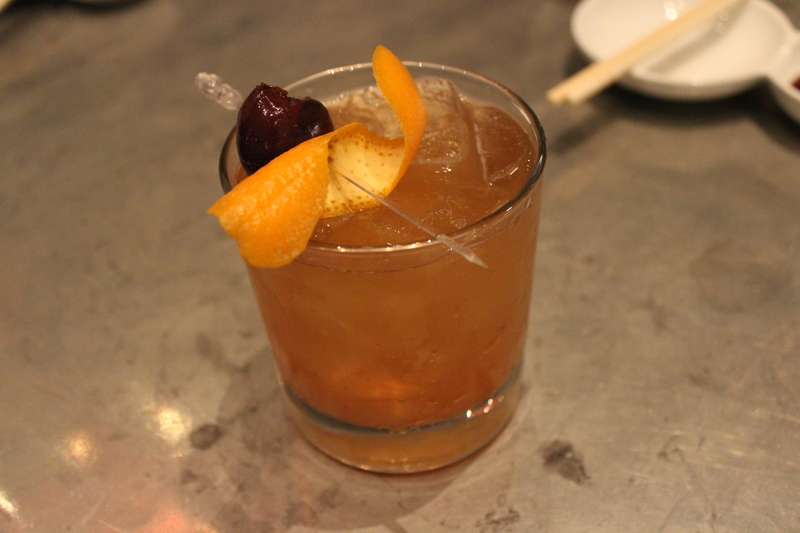 I’ve got to give a hat tip here to Jonathan Neill, bartender at the Ritz-Carlton for turning me on to The Devil’s Cut with his take on an Old Fashioned that uses Devil’s Cut Jim Beam, black walnut bitters and orange bitters, and is served in a mescal washed glass, garnished with orange and bourbon-soaked cherry. Great cocktail. Incidentally, I think Devil’s Cut has been for sale for quite some time, but it’s currently $3 off at the LCBO until November 10th, so go get some. Categories: Cocktails, Liquor | Tags: devil's cut, evil's Cut, Jim Beam, whiskey barrel | Permalink.